OMEGA Hi-Lok® T-Handle Hex Keys feature fixed hex blades for Hi-Lok® and Hi-Lite® fasteners. OMEGA Hi-Lok® Loop T-Handle Hex Keys are needed whenever high torque is required for loosening or tightening fasteners. OMEGA Hi-Lok® Loop T-Handle Hex Key Blades are designed with heat treated, tempered alloy steel that provides high strength and resistance to rotational distortion and are precision formed to exact dimensional tolerances for a precise fit. The OMEGA ATHK250TL 1/4'' Loop T-Handle Hex Key is one of thousands of quality tooling products available from MRO Tools. 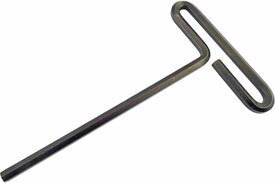 Please browse Hi-Lok T-Handle Hex Keys for tools similar to the OMEGA ATHK250TL 1/4'' Loop T-Handle Hex Key. OMEGA ATHK250TL 1/4'' Loop T-Handle Hex Key description summary: OMEGA Hi-Lok® hex key with a loop t-handle. Blade Size: 1/4'' Overall Length: 6'' Quantity discounts may be available for the OMEGA ATHK250TL 1/4'' Loop T-Handle Hex Key. Please contact MRO Tools for details.